Bob Dunn his brother had told us that Jimmy had fallen on his head in an accident in the early 90’s, and his short term memory wasn’t very good, but he had great stories to tell about the past. Bob also said that while the stories were great, he couldn’t verify they were true. We told Bob that no racer stories could hold water over the passing years. In fact that was the point of this magazine. There’s fact, there’s fiction and, somewhere in-between, there are the best stories. 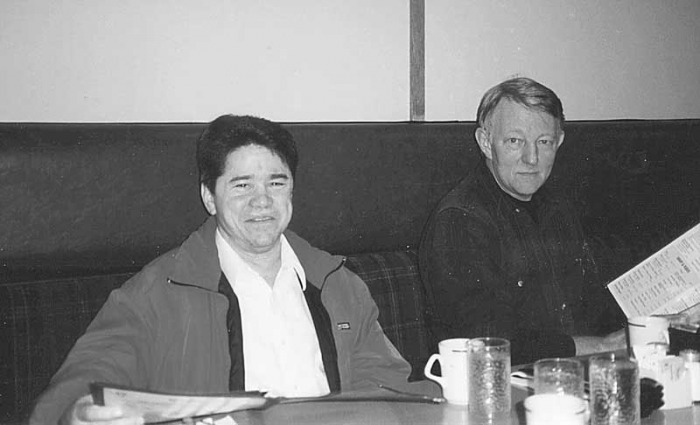 So Bench Racer sat down with Jimmy, Bruce Lind and Bob Dunn, and had a conversation over lunch at a bowling alley. After the interview we commented to Bruce Lind about what a nice person Jimmy was. Bruce said, "He wasn’t when he was racing." BR: What age did you start racing? Jimmy Dunn: I was sixteen years old. I had a bike loaned to me, and I went to Gold Creek Park, in Woodinville, and started right there in the dirt, flat tracking. BR: What was your racing weight, and how tall are you? JD: I’m 5’1" and 145 pounds right now. When I was racing I was still the same height, but only weighed 110 pounds. It was a big help being the motorcycle jockey. I had people ask me all the time what I did to get small and stay small. There were always a lot of questions on how hard I used the brakes. I could just dive into corners that much later before braking, because I was so light. BR: Did people ever accuse you of cheating by having more power or illegal brakes? JD: I just rode harder. I never had a banzai motor of any sort. I just had reliable motors that lasted the entire race. Bruce Lind: Except for maybe your original X6 Suzuki that you modified. Jimmy Dunn: Let’s just say that by being lightweight, it certainly didn’t hurt the power or braking abilities of the bike. BR: How many people are in your family? JD: I’m the oldest of six children. There are two brothers and three sisters. Dunn is an Irish name and we are Catholic. I think that six children is the average for that equation. BR: When did you first start flat track racing? JD: I’ve had a long history of racing, which all started off here in the northwest at tracks like Pacific Raceways, when it was originally called that. I first started racing at an indoor horse arena in Woodinville called Gold Creek Park, which I believe is still there. I later went on to race at Maltby, which is near Duval, Washington. I also raced at Graham Speedway. Bob Dunn: Jim used to ride his bike to school during the week, and on Friday night he would strip it down for racing at Gold Creek. The next morning he would put it back together to ride to school on Monday. Then he and some of his buddies, Jim Hallum and Russ Rotzler, would work on the engine and hop it up for racing. BR: Who were some of your racing rivals at Gold Creek? JD: Mike Steering and Bart Hansen are two names that come to mind off the top of my head. There were quite a few racers back then who taught me the lessons on how to race and how to win. I raced with Randy Skiver back then. He was a big dude, at over one foot taller than me, and very fast. The one story that I know aggravates him was about a race at the Everett Memorial Stadium. The race was during the halftime of a High School football game, and I got past him and was leading the race. Randy wanted to beat me more than anything else. I beat him by several hundred feet. Randy was a very fast guy on the dirt track or on the road race course. He is an incredible guy! BR: When did you first start road racing? JD: I had just graduated from High School in 1966, and had modified a Suzuki 250 X6 street bike. That first year I went to Daytona to race. I entered the Novice class, which had about 600 to 800 entries. BR: It must have taken an incredible amount of balls to race Daytona as your first race? Bruce Lind: That was Jim! JD: I got sixth place in the Novice race. Here was a no-good guy out of the northwest, on a home-built bike, beating most of the factory riders. It was the best. BR: Back then you basically made your own race bike? JD: I loved what I was doing. I loved going as fast as I could go. At home I had built the seat, the tank, the fairing, adapted the brakes, modified the motor, built the exhaust pipes and made a frame. It was a pretty impressive bike. The faster you went on the Suzuki, the worse it handled. It got into these giant tank slappers, and would wobble all the way down the straightaway. I would just hang on and keep the throttle pinned and do pretty well. 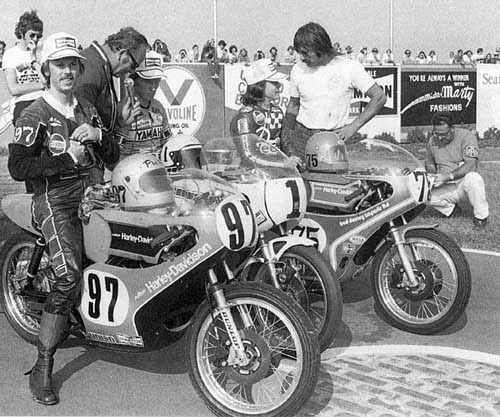 Bruce Lind: Let’s see, you were on the Suzuki, I was on the Kawasaki, Tim Coope was on the Yamaha RD56 and Gene Brown was on the production TE1C Yamaha. We were all racing at Westwood, and every time we were there it was raining. It was a very interesting series back then, because all the two strokes were so unreliable it came down to who could build a bike that would finish. BR: Who was the best road racer you ever saw? JD: I think Steve Baker was the best road racer I ever saw. Steve always had great equipment under him so he had a power advantage, but he was quite the speed kid. Bruce Lind: I have to agree with Jim. 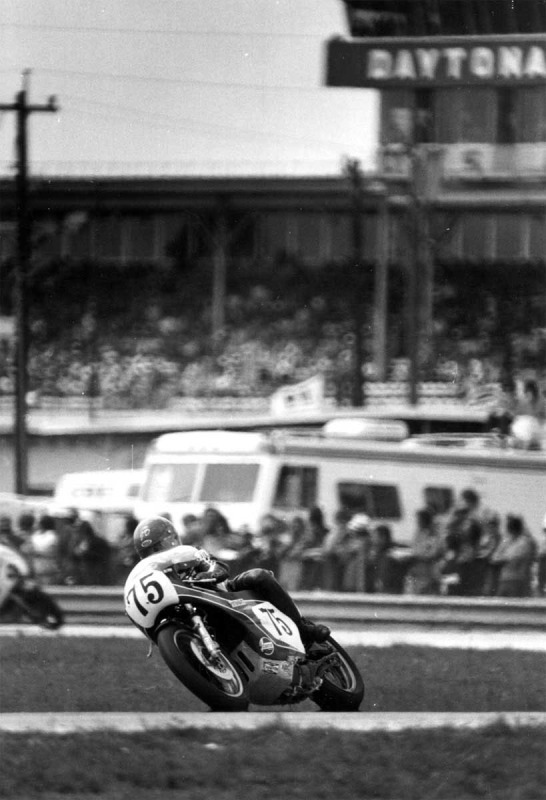 Baker pioneered the Yamaha factory effort on the 500cc GP bikes in Europe on a bike that was not competitive. Baker got the Yamaha factory team set up so that Roberts could come over there the next year and win the championship. Disagreements and internal strife within the team cut short Baker’s tenure with it. 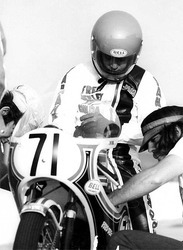 And one Canadian rider should be mentioned as one of the best in the world –Yvon DuHamel from Quebec, the father of factory Honda rider Miquel DuHamel. BR: Who was your greatest racing rival? JD: On the national circuit it would be an East Coast rider named Jimmy Allen. BR: Not, Mr. Dunlop Jimmy Allen? Bruce Lind: Allen and Jim raced for the Canadian national Championship a couple of years in a row. Steve Schaefer and I loaded up a van full of parts and bikes and drove it all the way to Mosport, Canada, for the last race of the year so Jim could try to get points for the championship. And then when we got there it was fogged out and the race was cancelled. JD: Locally, Jim Coope was a thorn in my side. Then later on Steve Baker replaced him as my northwest rival. JD: I think that Mosport, in Canada, was my favorite track, probably because I rode so many laps there. I also raced in two 24-hour endurance races for Yamaha at Mosport. Our team had three racers and three mechanics. I held the Mosport track record for many years until Steve Baker came around and took it. I set the record and then broke it a few times more up at the Westwood Track near Vancouver, BC. I also set the track record at SIR, and that also stood for quite a long time. Bruce Lind: Jim mostly set those track records in the late ’60s and early ’70s. 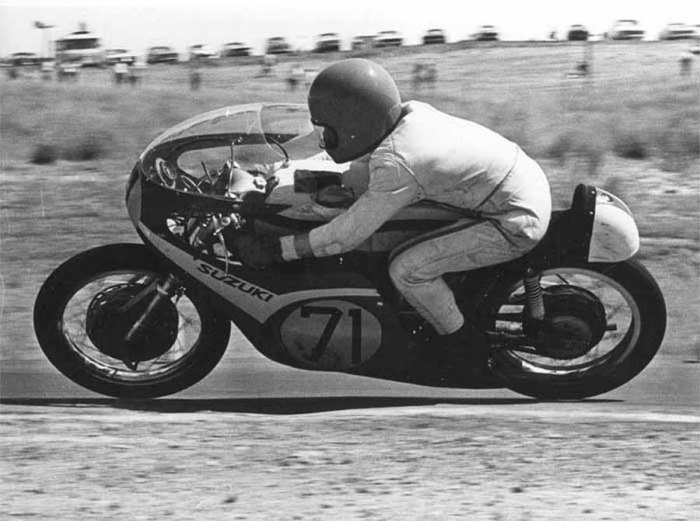 Jim was the guy I always set my sights on because we were similar ages, and he was this upstart on this damn Suzuki. What interested me was that Jim was able to do enough of his own modifications to make the Suzuki X6 reliable and fast enough to impress the Suzuki team, and so to get picked up as a racer. I believe you won the first race held for juniors at Sears Point Raceway on a 500cc twin Titan factory Suzuki? JD: Suzuki was real happy with me after Sears Point. It gave me a Suzuki to race the Canadian Championship with and said, "Good Luck." BR: Tell us your most interesting crossing the border story – which we can print? JD: I was always questioned thoroughly when I crossed the border because here I was, this guy with a van loaded full of bikes, parts and gasoline. We just went through the truck stop border crossing to get through faster. Bruce Lind: After you started getting support from the motorcycle company distributors you would have up to four bikes to ride a weekend. BR: We’d heard about physical body searches? JD: I had long hair and a van that sounded like a racecar, but there was never any reason why they should search me and they never found anything. I was strip-searched a few times, and then they would make me completely unload the van and even pull the carpet from the floor until they were satisfied. BR: When did you start racing on the National circuit? JD: I raced full time as much as I could while working to support myself. In 1972 it became even more difficult to get time off for racing as I started teaching school. I would use my spring break from school and head to Daytona to race. I loved that track. When school was let out for summer I could spend my entire time racing. BR: What was your highest finish at the Expert level of road racing? JD: I think it was finishing in third place at the Ontario Speedway, behind Kenny Roberts and Ron Pierce, in the 1974 AMA National 250 race. I was riding a Harley Davidson 250, as was Pierce behind Roberts’ factory Yamaha. Sonny Burres owned and tuned the Harley I was riding. Sonny is a really interesting character who has a lot of interesting stories that somehow I always turn out to be the bad guy in. BR: Did you ever do the Gas-n-Dash? JD: No. I had enough support from the people back home and the factories so that I could stay in a hotel, eat and pay for gas. BR: Have you ever been arrested? JD: Yup! I got my nose into something that I should have stayed away from. It caused some grief not only for myself, but also for my parents and my sponsors. It was a tough road to go down. It damaged my reputation for a while, but I kept clean and kept on winning. They took me back again because I would win everything I entered. The media likes the winners. I was always friendly with the media, posing for pictures and such. So when they printed an article about me it was always favorable. BR: What was your most interesting road trip story? JD: I was racing at Mosport, finishing a 24-hour race. On Monday morning I had everything packed up in my Datsun 240Z, with a trailer that had a Yamaha 250 and 350 with all the spare parts on it covered by a big tarp. So I had this little sports car hauling this big block of a trailer behind me as I headed towards a race the next weekend at Laguna Seca, on the California coast. I drove non-stop by myself until I got to the west coast. As I came into San Jose, California, I heard this big explosion and I got hit in the shoulder, which knocked me around. I pulled off the freeway and my windshield was broken. What had happened was a truck on the freeway had lost a four-ounce tire weight, and it went through the windshield and hit me on my shoulder, just missing my face. BR: Tell me an interesting story about Steve Schaefer or Bruce Lind? JD: They were always trying to catch me. We always had our pits close together and would chum around. The pit tootsies were always socializing with each other. Bruce Lind: By the way, my pit tootsie says hello to you (his pit tootsie is the lawyer, Ms. Edith Bowler-Lind). BR: How many women were there Jim? JD: Only one at a time! BR: When did you stop racing? JD: 1978. I was teaching full time and had other odd jobs like restaurant equipment management. I got myself too involved with life outside racing to be able to devote the time and energy to racing I should have. BR: Many people don’t know that you have had diabetes most of your life? JD: I’ve had diabetes for 48 years now, since I was six years old. I was always running to go to the bathroom, to urinate, while watching HowdyDoody on TV. My mother was curious about why I was drinking so much water and going to the bathroom so much. She brought me to see the doctor, and he gave me a blood test, and right off they found I had diabetes. I had the typical warning signs of diabetes, like falling asleep. I started using insulin needles straight off at age six. Bruce Lind: When he was racing he wasn’t real good about watching his diet, so he would have really wide swings in blood sugar. Bob Dunn: Jim would have his daibaetic reactions here and there, but those of us who knew about him knew exactly what to do if he ever got himself in a situation. There were always saltine crackers and orange juice around. JD: They knew how to look at my eyes and have me stare at them. If I couldn’t stare at them with any serious intent they would suspect low blood sugar. BR: Did your diabetes ever affect you on the racetrack? JD: Not seriously enough where I stopped on the track, or injured myself or other riders. Bob Dunn: Before races we always made sure he had enough liquid in him. JD: I always had orange juice in my cooler. Everybody else would pack beer in their coolers, and mine was stuffed with OJ. Bruce Lind: I think there were probably some situations towards the end of the race where Jim was not able to do as well at a National event because of the increased length. Jim could have done better if he hadn’t had to deal with diabetes. I agree that it didn’t cause any of his many accidents, those were usually because of dumb luck. BR: What were some of your better racing skills? JD: I think cornering was where I was best. I couldn’t be like Kenny Roberts and drag my knee around a corner, because my legs just weren’t long enough to touch the ground. Bruce Lind: I saw Roberts at Daytona this year. He’s about your size, Jim. You forget how small he really was. I think he is about 5’4" tall, which is still 3" taller than you. Roberts had a big man ego, though. BR: Jim, you must have been one of the shortest racers out on the track? JD: I wouldn’t allow anybody to tell any short jokes. If they did tell a short joke, I would just go out and beat them on the track. That was the best revenge! BR: How was it to be a factory-supported rider for Suzuki, Yamaha and Harley Davidson versus the lowly life of a privateer? JD: It was a big load off my back not having to be a privateer. On the other hand I rode like hell for the factories, because I felt they expected the very best performance from me. BR: Tell me a little bit about your family and racing? JD: I appreciated to be allowed to ride and race by my family. I loved my father very much. I always thought he was a genius. He was so talented and skillful in his job as a teacher and house builder. I didn’t want to let him down, so I rode as hard as I could every race. Bob Dunn: My dad was always supportive of Jim by being at all the races. He had a wrench in one hand and a bottle of orange juice or water in the other, ready to help Jim out with what ever he needed. He was always part of the team. All the rest of the family came out to the races when they could, and supported Jim also. Bruce Lind: Steve Schaefer told me something about your dad, who was a football coach at Everett High School. He taught and coached some very famous college and professional football coaches such as ex-WSU/University of Miami/Seattle Seahawks and current Oregon State University Dennis Erickson, Mike Price from WSU and ex-UW coach, Jim Lambright. Bob Dunn: There were many more local coaches who graduated under my dad’s tutelage. BR: Is that why you became a teacher, because your dad was one? JD: I think that had a lot of influence on my choice. I loved what he was doing. I was always around his teaching at Everett High School. I would always hang around there after school, and watch him work with his classes. BR: What was the coolest thing about being a national class racer? JD: The notoriety. People were always asking me questions about how fast I could go, and why my motorcycles were so quick. They were curious about the acceleration and braking. They would ask me about the tires I was using. There was quite a war back then between Goodyear and Dunlop, with super secret formulas to make the tires stickier. BR: Bruce. You raced against Jimmy Dunn and you raced last year against another 250 GP racer, Jimmy ‘The Flea’ Filice, can you compare the two? Bruce Lind: They’re similar in size. Filice has been in the right place, at the right time, with the right equipment and the desire and support to win a couple of national Championships, where Jimmy Dunn wasn’t that lucky. Even though he did win Canadian Championships things didn’t work out for him in the U.S. The time period is different too, with Dunn racing in the ’70s and Filice racing in the ’80s and onward. There were significantly greater numbers of competitors racing in the ’70s as compared to the ’80s. You have to remember that Jimmy and I were the baby boomers. There were hundreds and hundreds of racers competing to just make the starting grid. At Daytona now they will take almost anyone who even shows up, and that’s not to denigrate the racers showing up today. 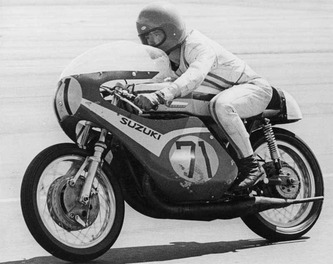 When Jimmy went to Daytona to race the Novice class with his X6 Suzuki there would be eight or nine heat races with 40 to 60 people in each heat. You had to finish in the top ten just to make the main event. Today you’re lucky to get 60 people for a class. I’m not saying the competition is any different, or any less now, but the numbers of people involved are different. JD: I think the AMA National at Laguna Seca, because I rode too conservatively and didn’t take my normal chances to finish higher up at the end. That was toward the end of my career, and I couldn’t recapture that moment again. BR: What was your biggest crash? JD: Laguna Seca was my biggest crash. I crashed so severely there that I fractured my skull in several spots, broke the fork sliders right off the machine and pretty much demolished anything left of the bike. JD: I took my 391cc Harley Davidson twin two-stroke down to New Zealand to race in the Marlboro Series. I was asked by the promoter to come down under and race the series, which consisted of eight races on both the North and South Islands. Ginger Molloy, the great Kiwi racer, was down there, and I made a lot of friends with the people of New Zealand. I finished fourth overall in the series. It was a real wrestling match when I got there though, because my luggage had been ransacked and all my parts and tools were stolen. I had to borrow tools from the Harley Davidson distributor. It was difficult to get parts for the Harley as it was a factory bike, and there were only four to five in existence. Update: Jimmy died a few years ago the results of a lifetime battling Diabetes.